Ask any mother and I'd be willing to bet they would all tell you the same thing was the second best part of being pregnant, right after your amazing baby and right before being able to eat whatever you'd like. It's something that mothers are missing for the first time since most of us were in middle school and it's the first sign there's a little bun in the oven. I've heard that some women can go up to 24 month's and I bet they don't miss it one bit. I wish I was one of those women and based on the hundreds of little tiffs Hubby and I have been getting into caused mostly by me this week I'm willing to bet he wishes I was one of those women, too. But, instead I am one of those women who just needs to overdose on Girl Time (with Reese and fabulous food bloggers), fried food, and chocolate. So, in order to quell my fried food craving, I took that adorable bundle of strawberries to the local supermarket on the hunt. About a month ago I had a delicious spicy chicken wrap at a local pizza joint that was full of avocado. Back in the day, I used to get the King Caesar wrap from Tropical Smoothie that was toasted and full of tomatoes. And I honestly can't get enough of Chili's boneless buffalo wings. I decided I'd combine my three great loves and lucky for me buffalo chicken strips were on sale today! I've mentioned I've been trying to eat healthier these days, switching to almond milk and eating all sorts of salads, but I think once a month a girl can splurge a little. I still used whole wheat wraps, does that count? The creaminess of the avocado, the coolness of the lettuce and tomato, the spiciness of the chicken, and the tangyness (yes, tangyness) of the ranch dressing come together in a perfect balance. 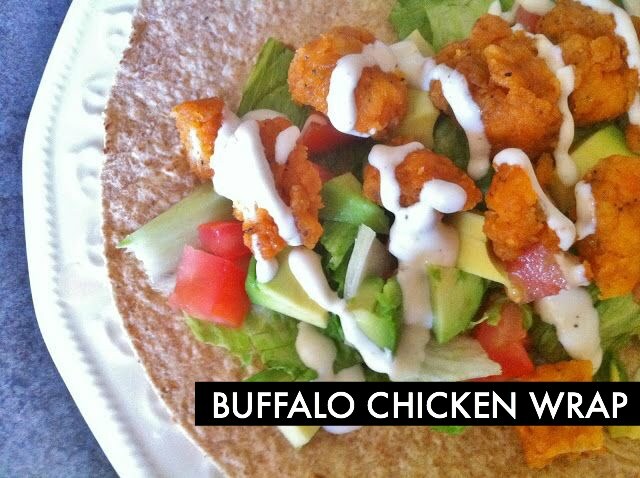 I suppose you could switch out fried chicken with grilled chicken, leave out the chicken all together, or use bleu cheese crumble instead of ranch dressing and this wrap would be much healthier. But would it be as good? I submit that it would not! The best part about this wrap is the crunch. The pizza joint's wrap was filled with tortilla strips but I prefer to just toast the wrap on a frying pan or use my Foreman grill. The flavors all meld together and the avocado is even creamier. But my favorite part is the crunch. I like me some crunch. If I really wanted to be healthy, I suppose I could've left out the scoop of Brownie Moose Track Ice Cream, too, but like I said, I was splurging. If you are having a week like me, if you are in a semi-homemade (minus the cocktail) kinda mood, or if you are craving Chili's boneless buffalo wings, Tropical Smoothie's King Caesar Wrap, or your local pizza joint's seasonal wraps but you moved to a town that has none of the above, then go on and make these today. You won't regret it! Place a large frying pan on medium high- high heat or turn on your Foreman grill. Layer all ingredients on wrap. Tuck both sides of the wrap in and roll up the wrap. Lightly spray the frying pan with non-stick cooking spray. Place the wrap, folded side down and toast (45 seconds- 1 minute per side on frying pan or 2 minutes in Foreman grill). Cut in half. Enjoy! Looks yummy! And yes it is probably a little higher in calories, but still nutritious! And ice cream has calcium. You need lots of calcium! Ha!